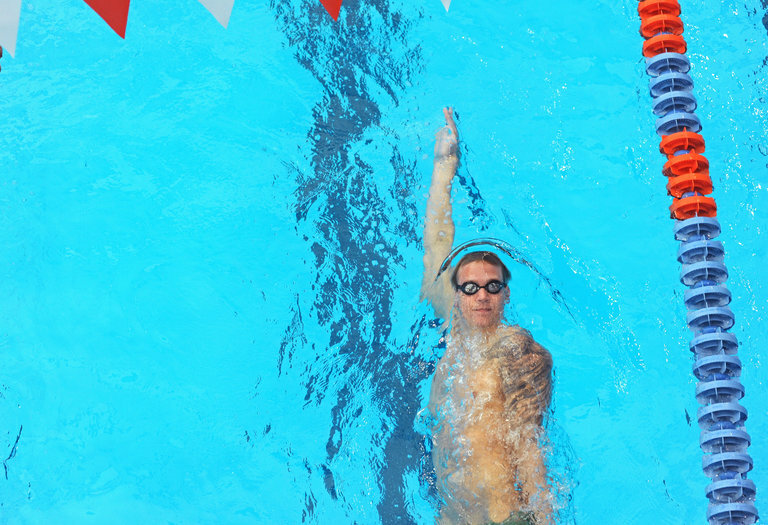 Caeleb Dressel swims laps during an afternoon practice at the University of Florida in Gainesville in 2016. Q. I’ve been a swimmer for years. Now I am a bit worried about the chemical absorption of chlorine and other additives, including other people’s body products, in swimming pools. Is this a legitimate concern? A. It’s understandable to be concerned about a chemical that dries out skin and hair and that has a smell that can linger long after a shower. But for the most part, experts say, there’s no reason to worry. Chemicals like chlorine and bromine are added to swimming pools to fight germs. Swimming without them could be like swimming in a petri dish, exposing people to all sorts of potentially nasty microbes, experts say. “The immediate benefits of disinfection far outweigh any potential long-term exposure risks,” said Lindsay Blackstock, a doctoral student in analytical and environmental toxicology at the University of Alberta in Canada, via email. Ms. Blackstock recently co-authored a paper showing that 31 of the 31 swimming pools her team tested contained an artificial sweetener that could have gotten there only through people peeing it out in the pool. And that’s the real danger: not the pool chemicals themselves, but how they mix with other chemicals that people bring to the water. Urine, along with body care products like shampoos, lotions and conditioners, interacts with chlorine to form volatile organic compounds that can be unhealthy to breathe. “After the chlorine reacts, you create a whole spectrum of potentially dangerous molecules,” said Andrew Chadeayne, a former college swimmer and a patent lawyer with a doctorate in chemistry. “The ones we know about are irritating to eyes and the respiratory system.” He invented a product called SwimSpray that is designed to remove the coating of chemicals that swimming in chlorinated pools can leave behind. At outdoor pools, these compounds usually blow away with the wind; indoor pools need good ventilation systems, said Dr. Chadeayne, who lives outside Seattle. “If you can smell the pool strongly, you’re not smelling the pool, you’re smelling those derivatives,” he said. And some people may be sensitive to them. The Olympic relay gold medalist and freestyle champion Caeleb Dressel was whisked away from a 2013 swim meet in an ambulance after inhaling too many fumes from a poorly ventilated indoor pool, said Mel Stewart, a two-time Olympic swimmer who now runs a swimming website called SwimSwam.com. (Mr. Dressel recovered.) Mr. Stewart noted that despite the risks, smelling like chlorine is a “badge of honor” for most swimmers. The other issue with chlorine is that, although it can be extremely effective in killing germs, it doesn’t kill every germ right away. The Centers for Disease Control and Prevention recently announced that outbreaks caused by the diarrhea-inducing parasite Cryptosporidium had doubled between 2014 and 2016, with 32 pools or water parks affected nationwide. To protect against getting ill from pool water, shower before and after swimming to remove germs and lotions, avoid swallowing the water and don’t swim with a diarrheal illness, the C.D.C. recommends. The bottom line: We’re vastly better off having pool chemicals than not, and chemically treated pools are generally safe to swim in, especially if they are well maintained and ventilated. Add to that some time-honored advice that probably bears repeating: Don’t pee in the pool. This article was originally written by KAREN WEINTRAUB and appeared here.